Winner of all major tourism awards,Llechwedd Slate Caverns offer two underground rides and free surface attractions. Llechwedd Slate Caverns at Blaenau Ffestiniog —finding us: beside A470, 25 miles from the A55 (Conwy Valley turning,Junction 19);10 miles from the A5 at Betws y Coed.Accessible by train from Llandudno Junction and Porthmadog. The Deep Mine tour begins with a ride on Britain’s steepest passenger railway for a walk through ten sound and light sequences, led by the ghost of a Victorian miner.The Miners’Tramway is a guided tour with demonstrations of Victorian mining skills. In the Victorian Village re-minted Victorian coins are available from The Old Bank for such delights as a penn’orth of boiled sweets at the Corner Shop, or a pint at the Village Pub. 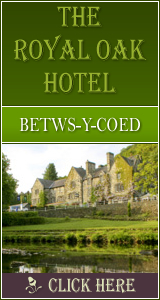 Catering includes the Plas Waenydd licensed restaurant,a café, a coffeeshop and the Miner’s Arms. Open daily from 10am (except 25/26 Dec and 1 Jan). Last tours into mines: 5.15pm from March to September and at 4.15pm from October to February. Special terms for parties of 15 or more. 1197 Click Throughs => �598.5 Since 13/May/2013 based on an example �0.50 cost of a click through from Google pay per click. The click through ratio to this accommodation provider's own website Since 13/May/2013 is 15% .